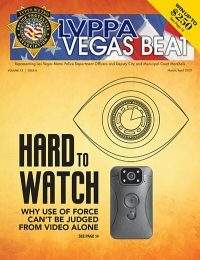 David Tilley writes regularly for Vegas Beat to highlight the importance of fitness and to share some of our members’ fitness routines and secrets. If you would like to be profiled, feel free to reach out to him at D14202T@lvmpd.com. You are what I would consider an endurance athlete. Not only do you compete in triathlons, but you run races and do bicycle-only events, like criterium racing and century cycling. For those of us who are uninformed, can you explain what criterium racing and century cycling are? Criterium racing is a bicycle race on a closed-road course approximately one mile, plus or minus, in length that is timed with a specific amount of laps. The race officials determine the amount of laps based off the average lap times, and can last 30 to 60 minutes. Criterium, or “crit,” racing is very fast paced with average speeds close to 30 miles per hour, and involves cornering through turns with cyclists elbow to elbow. Racing in a crit is very difficult physically and requires good bike-handling skills. You have to push yourself physically throughout the race, staying on the wheel of the rider in front of you and sprinting out of the corners to gain or maintain your position. 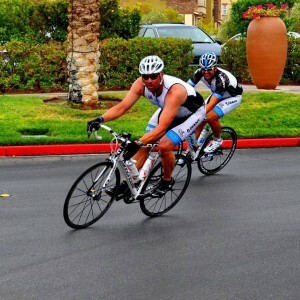 Century rides are 100-mile rides and are typically more recreational, but do require a level of endurance to complete. You have to dedicate time training on your bike to be competitive and to be able to be successful in completing the race or ride. Some people have a difficult time starting a fitness routine and sticking to it. How did you start and make it part of your daily routine? It helps to have a partner to train with and to hold each other accountable, and for me, it’s my wife. She pushes me and keeps me on track at times. My wife is a huge believer that you need to have a routine and stick to it. We also both belong to a men and women’s cycling team, Velo Vegas, and ride with our team several days a week and have several friends who are endurance athletes. I also use several apps and web-based programs, like Strava and Garmin Connect to create training plans and track my progress. The programs are easy to use, are compatible together and have built-in training programs for different sports, or even just basic workout plans for strength training. With all the running, biking and swimming you do, it is obvious you are in great shape. Any competitor will say competing is not just physical strength, but mental strength as well. How do you prepare physically and mentally for a competition? 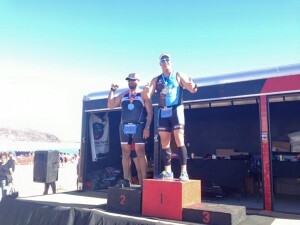 I would say that competing in endurance sports is 80% mental and 20% physical. Your mind will tell you that you are done long before your body will quit. One technique that I use is creating a mantra, and when you think you are done mentally, repeat your mantra to yourself and keep moving. My mantra is, “Pain is temporary … Quitting is forever.” I didn’t come up with the saying, but heard it before and it stuck with me. This helps me to push on past my threshold. I have this on my road ID to remind me when I need to be reminded. When I am about a week out from a race, I start visualizing the race and going through my race mentally. This helps me to get into my racing mindset. For example, when I am transitioning from my swim to my bike during a triathlon, I think of the steps — pull my swim cap and goggles off into the sleeve of my wetsuit, get the wetsuit off, put on my helmet first, then race belt with bib, bike shoes, sunglasses, etc. — until it is something that you do without even thinking about it. As for the physical part of preparation, I like to mix up my workouts. I usually will incorporate biking, running and swimming, but it is also imperative to add core, strength training, cardio and plyometric workouts to my routine. Can you give the readers specifics on how you fuel your body? How do you stay disciplined enough to stick with your diet? There are so many differing opinions on what the best diet is to follow out there in the fitness world. For me, I have tried several different ones, and the most sustainable one is portion control of good foods that are nutritionally balanced, low fat, non-processed foods. I eat a lot of chicken, turkey and fish and tons of vegetables. Again, it is difficult to stay on any specific, restrictive diet all the time, so if I do eat out it is all about portion control and trying to choose the better option on the menu. I also consult the owner of the Northwest Max Muscle, Jennifer Lee, who is a certified nutritionist. She creates balanced meal plans specifically tailored for the training and activities that I do. I use supplements during training and on race day, but do not switch or use anything that I haven’t used before on race day to avoid gastrointestinal issues. Any upcoming competitions we should be aware of? I just completed my fifth triathlon of the season with a first place win in my division, and have one more at the end of October. 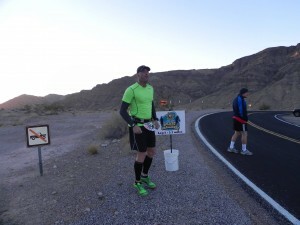 I also will be representing DTAC in the 2015 Brass Challenge by competing in the bike time trial and will be running with a team of friends in the 2015 Ragnar Relay Race. How has being fit help you be a better police officer? Being fit for duty is important for, first and foremost, safety reasons. The bad guys size us up all the time. If you are fit, they may not take the chance of fighting or resisting you. If you have to chase a suspect on your bicycle or on foot, you need to have the endurance to be able to take that suspect into custody at the end of the chase. Fitness is also important because it can reduce work-related injuries that could put you on light duty. I think it is also important to be fit for the image of the Department in the eyes of the public. Perception is everything nowadays. What advice would you give officers looking to adopt a healthier lifestyle? Join a gym that offers group workouts, boot camps, CrossFit or any gym that offers free classes. I have found that the best way to get started and keep going is to be part of a group. Group workouts can help to keep you accountable and push yourself to higher levels of fitness, and can be very motivating. There are numerous gyms in Las Vegas that are reasonably priced and have a lot to offer for new members who join. If you were the Sheriff, how would you incorporate fitness into the Department? I would like to see gyms at the stations to make it easier to get a workout in before or after your shift. This could possibly motivate others to work out at the stations, either as a group or individually.